One of the key features of Posterous is the ability to use their screen capture facility to cross post your content to your Posterous blog, even if you have published it elsewhere such as on your own website or blog.. This gives you the ability to leverage your writing and other online content. The concept here is to capture content from one of your sites and add it to Posterous for backlinking and promotion. The image above shows how I have captured an entry from one of my RedGage blog posts and posted it to Posterous. Ideally, you should add 100 words of comment and add a link back to your target site (which will appear as a hyperlink). The beauty of this video screen capture on Posterous is that it displays as a streaming video and can be played on the site. 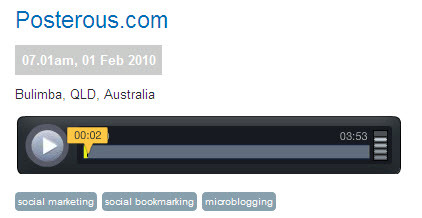 Posterous enables you to leverage your small business marketing online – blog posts, videos, podcasts, images and articles – by cross-posting from your other social media sites through the screen capture facility.